Our online company stores are built with love and care. Ultimately, we want every company we help to be completely satisfied with the store they receive. We are proud to offer many standard online company store features but with that in mind, we build our stores out to be fully customizable. This means that everything from the design to functionality can be built out and modified for your needs. Starting with the design, we work with you to make sure we’re meeting all brand guidelines. Your brand colors, logo, and font are all taken into account when building out a store. 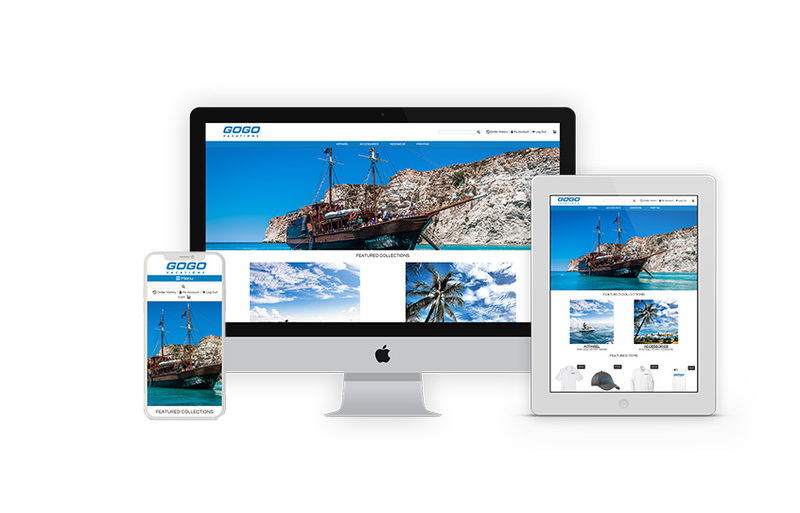 Our stores are all built to be responsive, meaning your company store will look great and be easy to use regardless if a user accesses it on a phone, tablet or computer. Reporting and analytics are an important part of any manager’s tool set. That’s why we provide you with a suite of pre-built reports, along with Google Analytics support, to cover all the bases. With an online company store, it’s important to keep a close eye on key metrics, such as site inventory and revenue by user to ensure your site is being used. Integration services can help make your online company store easier to implement and deploy to your company. That’s why our store platform has an API that lets you plug it into any system you want, giving you the power to create a connected online company store experience. Variable data products give your users the ability to create their own custom print products by swapping out elements such as text or images. Instead of having to spend hours creating business cards or flyers customized for each employee, all you need is a base design and you can have the user type in their information to fill out their details. You can even upload a spreadsheet of data and have it batch apply to a product, letting you handle large sets of user info with ease. It’s important for an online company store to have a way to easily manage employee spending while also being able to reward employees. Promo codes and gift cards are a great way to reward workers or create a special promotion. All of our online company stores come standard with an SSL-secured site on our mybrandhub domain. For an extra cost, we can setup a custom domain with an SSL certificate for your company. Our user management tools let you manage your users on a global, group, or individual scale. Site-wide, you can control access to the site by requiring a user login before being able to access it. You can also setup guest checkout if you’d like to let a site visitor checkout with being prompted to create an account or log in. Dialing it down, you can setup groups for your users, such as an admin group, that will let you assign special permissions or budgets. You can go even further and set it all up on a per-user basis, giving you the option to give each user their own unique set of products, permissions, and budgets. Budgets let you assign a spending balance to a user. That user can then use that balance as a payment method, allowing them to make purchases on a store without using a credit card. The balance can be set to automatically renew after a certain time, making managing time-based budgets easy. Budgets are a great way to push users to the store and increase average order value, as people are more likely to spend a greater amount with their budget compared to if they didn’t have a budget. Someone at the New York office should see a different set of products than someone at the Seattle office. In short, not everyone should be able to view all products, but some should, and you need to define restrictions for some customers and admin rights for others. This is where user roles come into play. Guest checkout allows users in an online company store to proceed directly to checkout with needed to log in. Commonly used in retail sites, this helps lower abandoned cart rates and speeds up checkout for users. This lets you use our store platform as a one-stop distribution center for everything from branded apparel to business cards to downloadable logo files and brand guidelines. 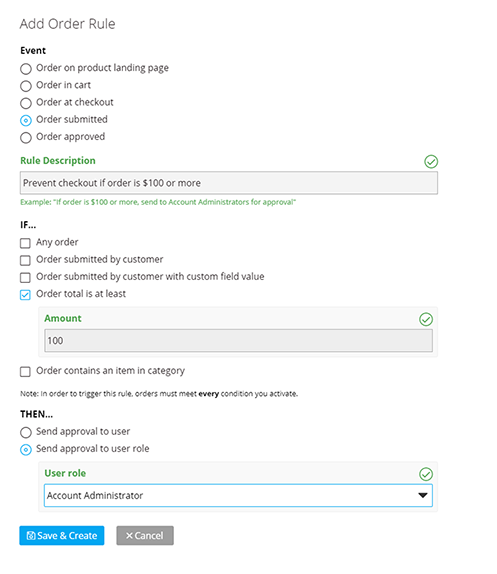 If an order in a user’s cart exceeds a dollar amount, you can prevent checkout and display a message telling them to lower it before being able to submit the order. If an order is submitted by a certain customer or contains an item in a certain category, you can have it sent for approval before it can be finalized. We make inventory management easy for you. You place a stocking order, we receive it, store it for you, then ship it out whenever an order is placed. No more scrambling to the back and digging through boxes to ship out some promotional gear to your employees. No more having to hand count everything either; we provide you with multiple reports to show you inventory counts, restocking points, and more. You need to get your promo products to your various offices all over the world. We’ve got you covered. We make it easy to distribute promo products, print, and digital material to the people who need it. Kitting and custom packaging are two ways to differentiate your promo offerings. Kitting let you combine multiple products to form a single kit product, allowing you to create themes around products and send them all at once. This is great for employee welcome kits or holiday gifts. We can pre-build and store kits for you or build them on-demand. Custom packaging gives you the option to add a custom design to your box. This pairs well with kits as you can easily maintain the same brand image and consistency. Custom branded merchandise is a unique way to create a connection with your customers and promote your brand. It can be a simple gift or it can be a well-thought out series of packages that takes the user through a guided journey, we can get you the right products and ideas to fulfill it. When you have a brand that’s going to be showing up in hundreds of thousands of different places, it’s important to make sure that all representations of your company are the same. Everything from the logo on your business cards to the colors used on your posters should follow the same brand guidelines. The marketing and art people that deal with this everyday know how it goes but the salesperson 3000 miles away from the corporate office might have some trouble with it. That’s why Metron makes brand consistency easy with a company store. All of your branded materials are configured and checked to ensure they meet your brand guidelines. We take care of all the heavy lifting while ordering print materials becomes as easy as entering your information and adding the product to the cart. When you sign on with Metron Branding, you get your very own account rep to reach out to for anything. Order questions, product ideas, company store help, fantasy football draft tips, your account rep is here for you! Your account rep is always each to reach out to. Give us a call at 248-545-4444, email us at info@metronbranding.com, or start a live chat below to get help.